Yoshie Nakanou is a vocalist from EGO-WRAPPIN’. She formed EGO-WRAPPIN’ with Mori Masaki in 1996 , writing together. Songs such as “Shikisai no Blues” and “Kuchibashi ni Cherry” became extraordinary long hit ,mixing a variety of genres into their own unique style. Since they, they have been drawing the scene’s attention with their cutting edge musicality in every new piece they release. In May 2014, they released four-song single “BRIGHT TIME” including TV drama opening and ending themes. 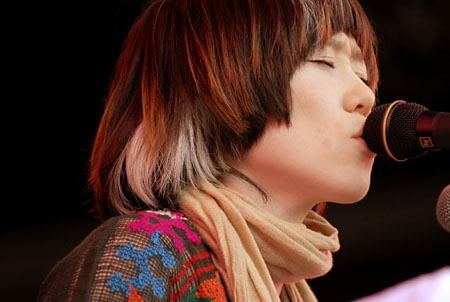 Along side her duo career, she released her solo album “Soleil” in 2007 toured throughout Japan. She also got invited by Yuji Ohno & Lupintic Five to sing for Lupin the Third theme song , also she has been featured as a guest vocal in so many other artist in and outside Japan such as Tokyo Skaparadise orchestra and Segio Mendez.